Who Are Employers Looking For? 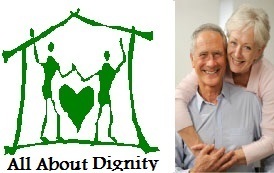 All About Dignity started in October 2007 teaching skills to caregivers who want to care for someone with physical needs above the norm. The 22 hour class provides participants with the knowledge to provide care at home or move into the health field as PCWs (Personal Care Workers). Families often take this class to learn skills to help loved ones with their daily routines such as using the bathroom, showering, wheelchair transfers, dressing, and other supportive care needs. People working as PCWs take this class so they can provide employers with a certificate that shows they know how to do the care as required by Colorado's Department of Public Health and Medicaid. CNAs take this class to learn what the differences between what a PCW and a CNAs duties are. There are many. Others such as Social Workers, RNs, EDs, Marketing staff and front office staff take this class so they are able to step forward when the need arises such as when someone starts to fall or for cross training. Yes, we are the only PCW class in the area that follows all three Medicaid, Department of Public Health and teaching requirements for a PCW class. If you take a class that's less than 20 hours long they are not doing that. For us its not just about getting a job but knowing what it takes to KEEP it. Activities of Daily Living (ADLs) are necessary daily activities such as showering, brushing teeth, walking, dressing, grooming and eating/drinking. As chronic illnesses progress we begin to loss the ability to do ADLs on our own. This class teaches participants how to help others do all the ADLs. Participants who have learned to assist with ADLs have learned “skills” that they use to help people that can’t do them for themselves. Class participants receive the 121 page handbook, specifically developed for this class, and handouts showing how the skills are done to assist in repeating them. In class, we do many of the skills several times to assist in remembering how to help a person with them. Teaching correct ways to do wheelchair transfers. "DO NOT (above) bend at the waist bend at the knee to protect your back." The classes are kept small so everyone experences what it feels like to be in a wheelchair as well as doing the transfers. "These are not brakes they are locks." We teach the differences. Could you do this? Watch the videos below.